Everyday our children spend six or seven hours in school for the learning of prescribed courses. Most of the time, teaching performance is provided in classroom and students don’t get time to make brainpage for knowledge transfer. That is why homework is assigned for the practice of subject matter at home. Is the time period of seven hours is not sufficient to make brainpage in classroom? It’s global declaration that homework is a part of school culture but we have never imagined that our kids are suffering from the extreme fear of classroom and homework in school system. A classroom built on the fear factors is a classroom that denigrates the importance of knowledge transfer in the community. The cognitive circuit of prefrontal cortex becomes paralyzed in the state of extreme fear that activates the limbic circuit of brain for emotional avoiding responses. A classroom built on fear factors is observed in the reality of reward, persuasion and punishment. It is fact that the foundation of children’s classroom must be based on the neuroscience of knowledge transfer. Why are you giving homework to children? Home is not school and parents are not teachers. Time period of seven hours is enough to make the brainpage of subject matter in classroom. Students have so much homework they couldn’t finish it in the evening. They try to solve it at night and sometimes it was not made complete. Children are so afraid that they won’t develop high speed brainpage to write the required answers in tests or exams. Low grade performance makes them angry, depressed and more afraid. It’s the world of fear that causes qualified educators to go against their pedagogy and pretend that they are just fitting into the school culture of teaching theories. That is the classroom of fear factors in which many of hard working students inhabit, hoping that they will build their future lives by achieving the excellence of skill, knowledge and merit in the knowledge transfer of graduation. Educators can’t believe that teaching is the waste of school hours. We must appreciate that teaching presentation couldn’t induce brain plasticity for the knowledge transfer of subject matter. It is fact that homework is not helpful for learning retention, and often is more harmful than it is beneficial. We have to appreciate the truth that our children must feel free at home. Human brain of the students needs the evening to unwind, likes to spend time with family and friends and pursues the hobbies or other interests of social or cognitive drives. Fear of exams is found very high in students because they have to secure high grades in performance. Brainpage is not made in classroom to meet the requirements of tests and exams. Teaching theory is the school system of conventional learning and it is about 5000 years old system. In the traditional model of classroom instruction, the teacher is typically the central focus of a lesson and the primary disseminator of information during class period. Students may defer directly to the teacher for guidance and feedback, while the teacher is very active in responding to the questions of problem solving activities. In a classroom with a traditional style of instruction, individual lessons may be focused on the explanation of content utilizing a lecture method. Beta version and web forums are the learning mechanisms of advanced technology for smart updates and high success. But classroom teaching isn’t the beta version of book to brain knowledge transfer. Students should be transformed into small teachers to modulate smart brainpage in learning mechanism and knowledge transfer. Student’s engagement in the traditional model may be limited to activities in which students work independently or in small groups on an application task designed by the teacher. Class discussions are typically centered on the teacher, who controls the flow of conversation. Here, the teacher is working, so he is making brainpage in the classroom. If students do the work with brain circuits, they will modulate smart brainpage in classroom for the knowledge transfer. Typically, this pattern of teaching also involves giving students the task of reading from a textbook or practicing the concept by working on a problem set, for example, outside school as project work or homework. Flipped classroom of the school system intentionally shifts instruction to a learner-centered model. In this design, class time explores topics in greater depth and creates the meaningful opportunities of knowledge transfer in brainpage making process. But educational technologies such as online videos are used to deliver lessons and contents outside of the classroom for watching and learning at home. It means that students are not free at home even in flipped school. It is published online that the grade performance of students has improved in flipped school system. But this achievement has been obtained because of brainpage development in classroom. Student’s brainpage is the outcome of learning process and knowledge transfer. In fact, school learnography is defined as the applied neuroscience of knowledge transfer that is processed to make brainpage in classroom for the learning, writing and understanding of our children. Homework’s relationship to improve student’s learning and performance is minimal at best for high achievement. Thinking that homework helps with student’s success is a myth that needs to be debunked with the facts and findings of neuroscience to verify the classroom reality of knowledge transfer. The myth of homework as an instructional tool is as insignificant as small class size, longer school days, grade retention, remediation and technology. The only real and most significant variable for student’s learning is the system of knowledge transfer. It’s true that students write answers in the exams by using the modular brainpage of knowledge transfer. Listening to the teaching is only motivational aspect, but can’t modulate brainpage in the learning mechanism of brain circuits. School is the learning place to acquire skill, knowledge and merit for the graduation of prescribed courses while student’s brainpage is the outcome of knowledge transfer to meet the criteria of academic evaluation. That is why, the brainpage theory of knowledge transfer defined as system of school learnography is the future of school education to study the design, methods and advancement of mathematics, science and technology. It’s a general concept that school homework is helpful in keeping children engaged in learning practices at home. Educators believe and fear that eliminating homework will increase time period on iPads and with social media. These electronic devices have become the default mechanism for children and adults when there is free time or boredom. So, they rush online to take the place of human interaction on social media or online chats. Educators suggest that parents want children to stretch and grow rather than be glued to a tablet. That is why homework is beneficial to rehearse, practice and make high speed modular brainpage for the proper transfer of school chapters. The extraordinary story of Thai cave boys’ escape from snaking caverns of the Tham Luang caves of northern Thailand was not just followed in Thailand, but by millions of people around the world. British divers said that search operation was very dangerous and life threatening. 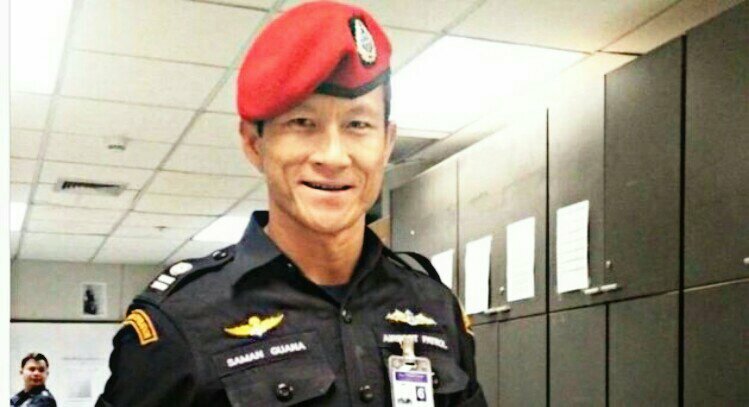 The former Thai Navy SEAL, Saman Gunan, died during the rescue mission while supplying oxygen tank in the cave. Survival was the first factor in rescue operation and the boys expressed gratitude and happiness when they first met British divers. It was a really good success to save their lives and ambitions including the football coach, and they also wrote some notes to their parents and school. The first note came from one who did not include their name: “If they go out, they’d like to eat many things — they want to go straight to their home — not too much homework, please. A child of five years’ age becomes very frightened and highly stressed when homework is not well-finished to attend her classroom. One of the secondary level students expressed his pathetic concern, “I used to be homework machine.” He developed severe problems with clinical anxiety. In real life situation, homework is associated with some level of stress for most children. However, for youth with an anxiety disorder, the pressure of assignments, tests, and deadlines can provoke panic and can disable them with fear. What can play an important role in helping these children to reduce stress in school system? That is the proper system of knowledge transfer launched in the fearless environment of learning development. Parents often feel it’s their job to get their kids to do well in school. Naturally, you might get anxious about this responsibility as a parent. You might also get nervous about your kids succeeding in life—and homework often becomes the focus of that concern. But when parents feel it’s their responsibility to get their kids to achieve, they now need something from their children—they need them to do their homework and be a success. This is a statement of the trained educator and I do not agree that parents will play the role of teachers at home. School system is responsible to finish knowledge transfer completely in classroom, nothing would be left for home. Everything must be finished completely in school hours. Classroom built on fear factors cannot produce students who are responsible for their own brainpage development and who will pursue self-directed learning from strong passion and not from hard pressure. As with many functions of the nervous system, there are various regions of the brain involved in deciphering the default fear in humans. There may be a situation which incites fear in perception, at that time the amygdala and hippocampus of limbic circuit record and decode the active frightening events with emotional markers through synaptic plasticity. Stimulation to the hippocampus will cause the individual to remember many past details, memories and consequences surrounding the situation of fear factors. Plasticity and memory formation in the amygdala are generated by the projection of zeid factors. Amygdala circuit is a very important part of the brain to produce learning drives in the comprehensive study of mathematics, science and technology. By activating the brain circuits, we can launch fearless knowledge transfer in classroom through modular brainpage processing. The amygdala system of subcortical brain has reciprocal connections and so it communicates in both directions with prefrontal cortex, hypothalamus, sensory cortex, hippocampus, cingulate cortex, thalamus, septum and brainstem. This mechanism of brain circuits is efficient to launch pencil power and smooth knowledge transfer in classroom by applying the brainpage theory and dimensions of learnography. Fear is the survival factor of life and the amygdala system of brain triggers the survival functions of fear factors. The drives of knowledge transfer also proceed on the derivatives of fear emotion like the fear of mistakes, failing situations and low academic achievement. But the fear of homework, teachers or the principal is harmful to the learning potentials of students. They must feel free in classroom to modulate concerned brainpage in the learning process of school chapters. When we sit quietly without doing anything, the imaging of many thoughts and events starts coming in our mind. If we let our mind wander for a few minutes, brain circuits are actually lighting up with a range of emotions. So our brain becomes full of emotional streams running in different affective states that can ruminate on prior stressors or we can get anxious about future events. This is the function of default mode network of brain in which mind wandering happens by recalling past life and episodic memory. Default mode network of brain is most commonly shown to be active when an individual is not focused on the outside world and the brain is at wakeful rest such as during daydreaming and mind-wandering. But it is also active when the individual is thinking about others, thinking about themselves, remembering the past and planning for the future. Bullying can threaten student’s physical and emotional safety at school and can negatively impact their ability to learn. The best way to address bullying is to stop it before it starts to threaten children’s life. Emotions like fear and love are carried out by limbic system which is located in the temporal lobe of brain. We know that the limbic system is made up of multiple parts of the brain but the center of emotional processing is the amygdala. It receives input from other functional regions of the brain like memory and attention. Amygdala is responsible for multiple emotional responses like love, fear, anger and basic desire. Stimulation or removal of the amygdala alters emotional response. Research has shown that electrical activation causes aggression while surgical removal results in indifferent emotional reactions. So, damage to the amygdala can result in abnormal emotional responses and over-stimulation causes excessive reactions. A fear appeal is a persuasive message that attempts to arouse fear in order to divert behavior through the threat of impending harm. An authoritarian style of leadership may create an environment of fear with no chance for dialogue and with complaining being considered futile. Hippocampus is another part of the limbic system that sends information to the amygdala. This is one of the memory processing centers of the brain that interacts with amygdala when a person has memories with emotional ties. The reciprocal connection between amygdala and hippocampus may be the origin of strong emotions triggered by the particular memories of space, object, time, instance and module. Prefrontal cortex of the brain is involved in decision making in response to emotional drive. It controls what decision a person makes when faced with an emotional reactance and also regulates anxiety. Cingulate gyrus acts as a pathway between thalamus and hippocampus. It plays a role in remembering emotional charged events. The cingulate cortex of brain focuses attention on the event by alerting the rest of the brain that it is emotionally significant in the neural processing of responses. Posterior cingulate cortex is emotion generator but anterior cingulate cortex is emotion encoder to produce zeid factors for the working mechanism of brain. Amygdala is considered as emotion decoder to launch the stream of zeid factors for the modulation of memories and drives. State of fear is believed to be an unpleasant emotional state involving physiological arousal that motivates cognitive, affective and behavioral responses directed towards alleviating threat or reducing fear. We know that the emotion of fear is stronger than the emotions of reward or love. Some memories may be lost in the state of extreme fear or severe trauma. Semantic memory is more affected in depressed situations. Everyday, the emotion of fear protects us from the dangers of critical circumstance. It is fact that fear factor is the default emotion of limbic circuits and it does not require neurotransmitters to activate the channels of emotion in work performance. Fear of exams is found very high in students because they have to secure high grades in performance. Brainpage is not made in classroom and students have to write exact answers in the exams. Fear is the strongest factor of human emotions and other emotions such as love, hate, anger, pleasure, reward, failure, sadness and anxiety are its permutations. The fear system of survival is sympathetic autonomic system of the brain responsible for flight, fight, freeze, fright and faint. In fact, fear is the default emotion of life that regulates the working mechanism of brain and it is generated in the posterior cingulate cortex of default mode network (DMN). Survival is the fundamental aspect of life and it is described in brain circuits by the generation of fear factors. On other hand, the success of goal oriented tasks is also secured by the fear factors of failure. Food, clothes, shelter, health and education are the basic needs of human life. So, it is obvious that education is the fifth basic need of people’s livelihood to be qualified for learning, working and good earning jobs. Teaching is the system of knowledge transfer in education and it’s about 5000 years old system. It’s main defect is that it cannot induce brain plasticity in classroom performance. Then what will be the future of education for the school system of our children? We know that the learning mechanism of brain is important for knowledge transfer and neuroscience can provide a smart system of knowledge transfer for our children in classroom. In ancient civilization, knowledge was transferred from one generation to another by telling about objects, facts and events in the form of stories, poems and essays. It was the evolution of teaching theories for skill and knowledge to change the thoughts and behavior of individuals. In this modern age of science and technology, the teaching system of knowledge transfer is not very effective to meet the challenges, hardships and development of future workforce. No teaching, no homework for kids! Future of education is brain learnography that will deal with the learning mechanism and knowledge transfer of school system. School is important for the knowledge transfer of mathematics, language, science and technology. The future of education is learnography that is the fifth branch of neuroscience and it conducts brainpage making process in school system for book to brain knowledge transfer. Posterior cingulate cortex of human brain is the central hub of default mode network that conducts knowledge transfer to memory centers during resting stage. Literally, neuroscience means the science of nervous system. But neurology is the medical specialty dealing with disorders of the nervous system. It deals with the diagnosis and treatment of all categories of disease involving the central, peripheral, and autonomic nervous systems. Neuroscience is also known as neurobiology and this is the scientific study of nervous system including the functions of brain parts. It is a multidisciplinary branch of biology that combines physiology, anatomy, molecular biology, developmental biology, cytology, mathematical modeling and psychology to understand the fundamental and emergent properties of neurons and neural circuits. Fundamental anatomy of brain regions and the physiological properties of neuron projections and neural circuits must be basis to launch the knowledge transfer of children in school system. Book to brain knowledge transfer is possible in the learning mechanism of brain but school system runs on the teaching theories of education based on the rational thoughts of cognitive science. Neuroscientists have described many branches of neuroscience, but most of them are related to clinical significance. But I have classified only the seven branches of neuroscience considering the importance of academic perspectives for the knowledge transfer of school system. This is a branch of physiology and neuroscience that is concerned with the study of the functioning of nervous system. In this field, scientists investigate the central and peripheral nervous systems at the level of whole organs, cellular networks, single cell or even sub-cellular compartments. This is the study of the structure and organization of nervous system. It helps in observing how damage or lesion to specific brain areas affects behavior or other neural functions. Delineation of distinct structures and regions of the nervous system provides knowledge in investigating how it works in functional studies. Several sets of topographic terms are used to denote orientation and localization which are generally referred to the body or brain axis. This branch aims to describe the cellular basis of brain development and to address the underlying mechanisms. It draws on both neuroscience and developmental biology to provide insight into cellular and molecular mechanisms by which complex nervous systems develop. This is a branch of neuroscience that observes concepts and studies in molecular biology applied to the nervous systems of human beings. This branch examines the biology of the nervous system with molecular biology, molecular genetics, protein chemistry and related methodologies. It covers topics such as molecular neuroanatomy, mechanisms of neurotransmitters or molecular signaling in the nervous system, the effects of genetics and epigenetics on neuronal development and molecular basis for neuroplasticity and neurodegenerative diseases. Learning dimensions of the brain provide biological basis for the understanding and physiology of perception input, learning pathways, memory consolidation, behavior and consciousness. This is the brain science of learning mechanism that can be launched for the knowledge transfer of school system. It deals with the neural projections of cognitive circuit, association circuit, limbic circuit, memory circuit, motor circuit and zeid circuit to make smart brainpage in learning process. Design of advanced technology has a fundamental influence on how people understand the brain imaging and various aspects of consciousness, thought and higher order activities in brain circuits. It also includes technologies that are designed to improve and repair brain function and allow researchers and clinicians to visualize the parts of brain for tumor, stroke and disorders. This is the study of how drugs affect cellular function in human nervous system and the neural mechanisms through which they influence human behavior. Behavioral neuropharmacology focuses on the study of how drugs affect human behavior, including the study of how drug dependence and addiction affect human brain. Molecular neuropharmacology involves the study of neurons and their neurochemical interactions, with the overall goal of developing drugs that have beneficial effects on neurological function. Knowledge transfer refers to sharing or disseminating of knowledge and providing inputs to problem solving activities. In fact, knowledge transfer is the practical problem of transferring knowledge from one part of the brain to another to make modular brainpage in learning process. Knowledge management seeks to organize, create, capture or distribute knowledge and ensure its availability in the working mechanism of brain. From the source page of prior knowledge to learning, from learning to new knowledge and from active brainpage to application are the three major steps of knowledge transfer. Students have to face and accept the transfer of knowledge which is very much related to the problem of knowledge integration, knowledge application and knowledge use in the real world of performance and production. Transfer is a process by which knowledge, ideas and experience move from the source page of knowledge to the recipient brain of that knowledge. Knowledge transfer always refers to learning or making brainpage in one context and applying it to another such as the capacity to apply acquired knowledge and skills to new situations. We can write artificial intelligence to make computers smart in operation, but our children cannot make the smart brainpage of knowledge transfer in school system. Artificial intelligence is the ability of computer program or a machine to think, learn and act like human beings. Advancement of artificial intelligence evolves from the algorithms of modular brainpage. This is the brainpage theory of human learnography in which knowledge is transferred in machine learning. We know that object language is the language of machine technology. Brainpage of school learnography makes students smart in the knowledge transfer of classroom. Artificial intelligence is also known as machine intelligence and this is intelligence demonstrated by machines, in contrast to natural intelligence displayed by humans and other animals. In computer science, artificial intelligence helps machine to perceive its environment and take actions that maximize its chance of successfully achieving its goals. Artificial intelligence is applied when a machine mimics cognitive functions that humans associate with other human minds, such as learning and problem solving. Learnology is the science of observation, learning and experience that is conducted to acquire knowledge and understanding from the facts, events and happenings of surroundings. It is also referred to the concept of analytical studies obtained from functional objects, book reading and lecture performance. But learnography is defined as the neuroscience of knowledge transfer that is processed in classroom for the learning, writing and understanding of our children. We know that school is the place of knowledge transfer while the modular brainpage of students is the outcome of knowledge transfer. That is why the brainpage theory of knowledge transfer is the future of school education. It is remarkable that the zeid factors of cingulate gyrus project learning drives in brain circuits for the modulation of knowledge transfer. It’s crucial to hard working students while making brainpage in the learning process of classroom. How do our children secure big success in academic performance? We know that hard work, achievement and success are important for the happy living of human beings. Knowledge, skill and merit are provided in education but it is difficult to find a good earning job in spite of being graduated with higher degrees. In fact, there are many learning problems in skill development and knowledge transfer. Our school system is not working properly for high academic achievements. It is essential to analyze the working methods of school system on the basis of learning mechanism and brain learnography. Students are making chatpage in classroom but this is not the knowledge transfer of school system. They have to modulate brainpage for the subject matter of academic chapters. This is the learning mechanism of brain that is processed in the knowledge transfer of school system. Zeid factors project learning drives in brain circuits for knowledge transfer. It’s crucial to students while making brainpage in classroom. Brain of students doesn’t change physically in the teaching theories of school system, so homework is given to kids for the practice of knowledge transfer which is not finished in classroom. Knowledge transfer is everything for the personality development of students. Quality education also comes from the knowledge transfer of academic chapters. So students have to make brainpage in classroom for learning, writing and understanding. It’s general truth that our brain mechanism defines our humanity. It also makes us individuals what we are at achievement. Working brain is responsible for the generation of language and thoughts, attention and memory, behavior and imagination. Learning mechanism of brain is important for the knowledge transfer of school system. Learning from teachers and learning from brainpage modulation both are different approaches in school system. Teacher’s main work in classroom is knowledge transfer that is moderated in book to brain modular imitation. Teaching is not necessary for the brainpage module of knowledge transfer. There are five types of brainpage developed during knowledge transfer such as cognitive page, limbic page, motor page, academic page and intuitive page. Brain Research has been carried out in neuroscience to know the learning parts of brain but facts and findings have been collected for clinical perspectives to treat mental and behavioral disorders. Research is not done to develop the theory of knowledge transfer and plasticity that will help students in the learning process of classroom. We have to appreciate that teaching isn’t necessary in the knowledge transfer of school system. Book to brain knowledge transfer must run in classroom and students will learn subject matter in brainpage making process. Obviously, beta version is the learning mechanism of technology and its update, but teaching isn’t the beta version of book to brain knowledge transfer in school system. Meditation is a state of silence dealing with thoughtless awareness. When survival becomes eminent in the existing world of life, mindfulness meditation helps to reduce stress, anxieties and depression in adverse conditions. The extraordinary story of Thai cave boys’ rescue has been followed by millions worldwide since 23rd June. These boys and the coach were trapped inside the cave by sudden monsoon floods, when they walked into the Tham Luang cave on excursion after football practice. The 12 boys and their football coach had spent nine days in the cave with little food or light when British divers helping rescue search first reached them on 2nd July. Hundreds of volunteers, rescue divers and military personnel were involved in the rescue effort. British divers played a key role in the extraordinary international effort to rescue the 12 members of the Thai boys’ football team and their coach from a flooded cave. Captain Duganpet Promtep is 13 years old and described as a motivator and highly respected by his teammates. He had apparently been scouted by several Thai professional clubs. Myanmar-born Adul Sam-On is 14 years old. He speaks several languages, and was the only team member to be able to communicate with British divers when they were first discovered. It was 17 years old Peerapat Sompiangjai’s birthday when the group of boys became trapped in the cave. The snacks, the boys brought with them to celebrate were likely to have helped them survive their ordeal. Assistant coach Ekapol Chantawong, 25 years old, was said to be the weakest of the group when they were found, as he had reportedly refused to eat any of the food and gave it instead to the boys. Mr. Ekkapol was thanked for taking care of the boys and for helping them stay safe in the world of dark and cold cave. After his parents died in Myanmar when he was a young boy, he entered into the Buddhist monkhood in Thailand for nearly a decade. Mr. Ekkapol’s years of spiritual training has paid off in other ways. In the cave, he taught the boys how to meditate so they could pass the time without stress and anxieties. The practice of mindfulness meditation helped to save the lives of football players. 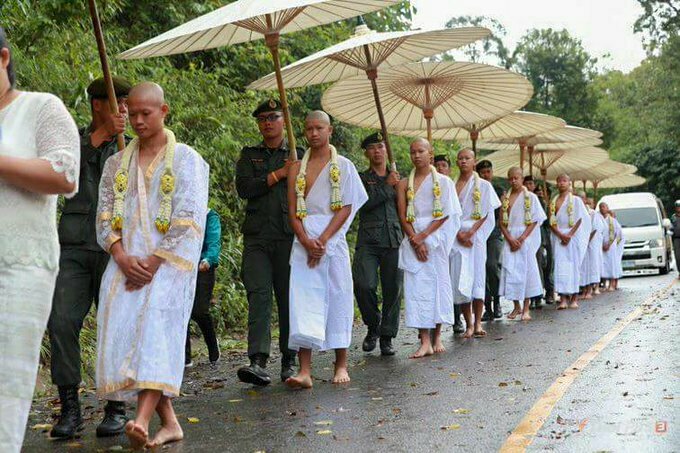 Most members of the Thai youth football team rescued from a flooded cave have had their heads shaved as part of a Buddhist ceremony to ordain them as novices. This step is intended to be a spiritual cleansing for the group, and to fulfil a promise by the families to remember one of the divers who died in the rescue operation. One Ex-Thai navy seal diver, Saman Gunan, died during the operation while installing oxygen tanks in the cave. Thoughtless silence is modulated in the posterior cingulate cortex of brain during meditation and mindfulness. Mindfulness meditation decreases activity in the default mode network (DMN), the brain network responsible for mind-wandering and self-referential thoughts. Posterior cingulate cortex is the central node of default mode network and it is also important to open the door of knowledge transfer, creativity and innovation. Mr. Ekkapol, the Wild Boars football club coach, had even withheld food and water from himself in the cave to provide for the survival of boys. This is a great example of leadership and teamwork practice delivered in unfavorable circumstances. There is difference between school leadership and class leadership. We cannot manage our way to a school of excellence. It will only happen through leadership and better teamwork performance. It must be effective school principal leadership and collective classroom leadership. Everyone must embrace it and pursue the excellence of school system everyday for the smart transfer of skill, knowledge and merit. Neuroscience is significant to treat the patients of mental disorders but it may be important also for the learning process of students. The volume of grey matter increases in the specific parts of our brain when something is practiced to succeed in work performance. It can be observed in neuroscience for clinical perspectives by using advanced technology. This is the advancement of neuroscience but it has done nothing in school system. Instance guided object learning (IGOL) is very powerful in knowledge transfer because instance has strong projection in posterior cingulate cortex to reflect the reactance of learning emotions. Teaching is the system of knowledge transfer in education, about 5000 years old system. We know that the learning mechanism of brain is important for knowledge transfer and neuroscience can provide a smart system of knowledge transfer for our children in classroom. Fear is the strongest factor of human emotions and other emotions such as love, hate, anger, pleasure, reward, failure, sadness and anxiety are its permutations. The disorders of posterior cingulate cortex may be attention eater in which the learning focus of brainpage making process is not maintained for the convergence of knowledge transfer. Sensory areas and roots are found in the posterior part of central nervous system, while motor areas and roots are localized in the anterior region of neural structures. This is the fundamental anatomy of brain circuits. Emotion is modulated to maintain and fix attention in a particular pathway of brain circuit for the performance of working mechanism. Depression is the disorder of fear factors caused in the cingulate cortex of human brain. What is the basic function of emotion? Fear is everywhere in our surroundings. Some people achieve great things in spite of their fear while other people are paralyzed into inaction by those very same fears. We establish relationship with everyone of those fears and anxieties. Depression, anger and anxiety come from a sense of disconnection. Anxiety makes us afraid of what we are are doing and thinking. It may happen that we could lose something, miss an opportunity or be inadequate. Posterior cingulate cortex forms a central node in the default mode network (DMN) of brain. DMN is crucial to the working mechanism of brain and plays a significant role in the learning mechanism of knowledge transfer. It has been shown to communicate with several brain networks simultaneously and is involved in various functions related to attention management systems. Posterior cingulate cortex of brain is the generator of emotionalized virtual reality to transfer knowledge spectrum in learning process. The posterior cingulate cortex of brain is the caudal part of cingulate cortex, located posterior to anterior cingulate cortex. This is the upper part of limbic lobe. Cingulate cortex is made up of an area around the mid line of brain above corpus callosum. Surrounding areas of posterior cingulate cortex include the retrosplenial cortex and precuneus of subcortical region. Fear factor is the root of emotional generator that is conducted in the posterior cingulate cortex of brain. Along with precuneus, the posterior cingulate cortex of brain has been implicated as a neural substrate for awareness in numerous studies of both anesthesized and vegetative coma state. Imaging studies indicate a prominent role for posterior cingulate cortex in pain and episodic memory retrieval. Increased size of posterior ventral cingulate cortex is related to declines in working memory performance. The posterior cingulate cortex of human brain has been strongly implicated as a key part of several intrinsic control networks. Structural and functional abnormalities in the posterior cingulate cortex of human brain result in a range of neurological and psychiatric disorders. Posterior cingulate cortex likely integrates and mediates information in the working networks of brain. Therefore, its functional and anatomical abnormalities might be an accumulation of remote and widespread damage in the brain circuits. Default mode network is most commonly shown to be active when a person is not focused on the outside world and brain is at wakeful rest such as day-dreaming and mind-wandering. But it is also active when an individual is thinking about others, thinking about themselves, remembering the past and planning for the future. Knowledge was transferred from one generation to another by telling about objects, facts and events in the form of stories, poems and essays. When people watch a movie, listen to a story or read a story, their DMNs are highly correlated with each other. DMNs are not correlated if stories are scrambled or are in a language the person does not understand. It is suggesting that network is highly involved in the comprehension and subsequent memory formation of that story. DMN is shown to even be correlated if the same story is presented to different people in different languages. It is further suggesting that DMN is truly involved in the comprehension aspect of knowledge and not the auditory or language aspect. Default mode network may be deactivated during external goal-oriented tasks such as visual attention or cognitive working memory tasks. So, some researchers label this network as task-negative network. If tasks are external goal-oriented for social working memory or an autobiographical task, the DMN is positively activated with the task and correlates with other brain networks such as the network involved in executive function. Posterior cingulate cortex connects our brain and body to the space, object, time, instance and module of external surroundings to generate proper emotions in processing like the cinema, TV serials, music albums, news telecast or live broadcast. Fear factor is the default emotion of limbic circuits and it does not require neurotransmitters to activate the channels of emotion in work performance. It is considered that the emotions of fear and reward are generated in the amygdala of brain. In fact, posterior cingulate cortex is the generator of emotions because this is the central node of default mode network of brain. We know that medial prefrontal cortex, posterior cingulate cortex and angular gyrus are the main nodes of default mode network of brain. Instance produces a specific emotion in the posterior cingulate cortex of brain, then it is passed to anterior cingulate cortex for the modulation of zeid factors. Finally, these zeid factors are projected to amygdala to set emotional markers for the processing of knowledge transfer.